It certainly makes a good story: Molière, playing the role of Argan the hypochondriac in his play Le Malade Imaginaire, is said to have died onstage in the middle of the fourth performance on February 17, 1673. The reality is a little less dramatic but still quintessentially theatrical: he struggled through to the end and died a few hours later; he was a man of the theater to the core. The new production of Le Malade Imaginaire at the Théâtre de Paris stars and is directed by Daniel Auteuil, whose most memorable movie roles include lead parts in Claude Berri’s Jean de Florette and Manon des Sources (1986), Patrice Chéreau’s La Reine Margot (1994) and Michael Haneke’s Caché (2005). Auteuil’s Argan is a glorious creation, never overplayed, full of little details of expression and gesture, all the more comic for its understatement. When other events seem to be taking precedence over Argan’s preoccupation with his own health, for example, the effect of Auteuil’s quietly self-pitying delivery of the line, “Je n’ai pas seulement le loisir de songer à ma maladie” (“I haven’t even had a chance to think of my illness”), is far more humorous than many grandiose deliveries of the line I have encountered. His interaction with his opportunistic young wife Béline (Natalia Dontcheva), who infantilizes him and humors his whims, works particularly well, with the feigned death scene a particular highlight. Auteuil’s real-life daughter, Aurore Auteuil, plays – and occasionally overplays – Argan’s plain-speaking servant Toinette with gusto; she could learn a little from the restraint of her father’s performance. Auteuil opts for a straightforward, traditional staging, allowing the action to evolve at pace without the intrusion of anachronistic directorial concepts. Only the updated idiom of the music performed by Cléante (Pierre-Yves Bon) and Argon’s daughter Angélique (Victoire Belezy) in the middle of Act II strikes a false note alongside the resolutely 17th-century setting of the rest of the action. Molière originally wrote the play as a comédie-ballet, collaborating with the composer Marc-Antoine Charpentier. In recent years, musicians like William Christie and Marc Minkowski have recreated the full musical and dramatic spectacle, which makes for a very long evening at the theater but also shows the extent to which Molière explored the aesthetic possibilities offered by the gradual fusion of words and music as the drama progresses. 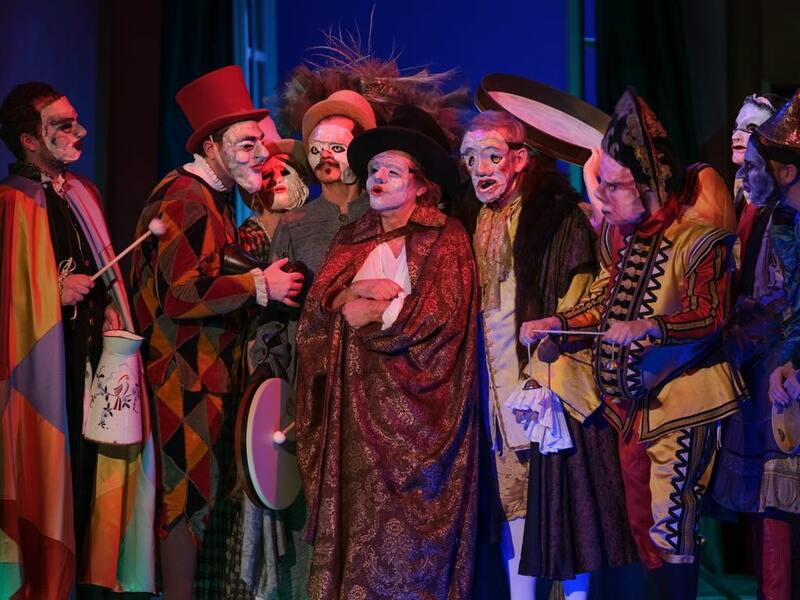 Even though the Auteuil production loses this balance of music and drama, it ends appropriately by recalling Molière’s debt to the masked figures of Italian commedia dell’arte in the ceremony making Argan into an honorary doctor. If you go to the production, do try and dine beforehand or afterward in one of the host of quaintly traditional restaurants in the environs of the Théâtre de Paris in the ninth arrondissement (we tried and enjoyed both the Café du Théâtre at 11bis, rue Blanche, and Les Comédiens at 7, rue Blanche). And take time to admire the charming decor of the theater’s spacious foyer/bar area. Less charming and definitely less spacious is the theater’s cramped seating, painful for anybody taller than 5 foot 2.